From this afternoon's Wall Street Journal. More evidence that activist shareholders create value for all shareholders. April 26, 2007 10:47 a.m.
Applebee's International Inc., mired in a slump, said it received several bids to be acquired and agreed to give activist investor Richard Breeden and one of his nominees board seats. The restaurant chain described the bids as "non-binding, preliminary proposals." A committee reviewing strategic options and the board will begin "a second round of detailed due diligence discussions before asking potential buyers to submit definitive, binding proposals," the company said. Appleebee's said it is also exploring a securitization of the company's royalty income stream and other assets, which could be used in either the recapitalization or by a potential buyer. News of the bids came as Applebee's said it settled a battle between Mr. Breeden and the restaurant chain. Mr. Breeden, which owns 5% of Applebee's shares and is the former chairman of the Securities and Exchange Commission, is looking to gain a majority voice on the seven-member board, saying current management hasn't used the restaurant chain's capital wisely and should rely entirely on franchise operators. The agreement announced Thursday by Applebee's, Breeden Capital Management LLC and its affiliated investment funds appointed Mr. Breeden and Laurence Harris to Applebee's board and ends a proxy contest. The Overland Park, Kan., company had advised shareholders not to vote for a slate of four directors offered by hedge fund Breeden Partners LP. Mr. Breeden also joins the company's strategy committee, which is reviewing strategic alternatives, and becomes a member of the corporate governance/nominating committee and the executive compensation committee. Mr. Harris becomes a member of the corporate governance/nominating committee and the audit committee. "Applebee's management and board of directors concur with Mr. Breeden that recent company performance must improve," said Jack P. Helms, the chairman of Applebee's corporate governance/nominating committee. "Mr. Breeden has raised a number of fair and appropriate questions which our management and board will continue to consider and address." The chain's independent directors formed a committee to explore alternatives for enhancing shareholder value, including a possible sale. Mr. Breeden pressured Applebee's to improve returns for shareholders by cutting the number of company-owned restaurants and curbing some spending, among other moves. The chain has been struggling to boost sales amid competition from a glut of similar-looking restaurants, at a time when pressed consumers have cut back on eating out. Talks between the company and Mr. Breeden had dragged on without an agreement. At one point, Mr. Breeden turned down Applebee's offer to give him two of the four seats he was seeking on Applebee's board. Mr. Breeden said Thursday, "With all parties willing to work together positively to look at the issues and to design new solutions for the future, there is no reason that Applebee's cannot make strong progress in a number of areas." Internaute(s): Eric Jackson, Monsieur "Plan B"
Thanks to Benoit BAILLEUL and Internautes magazine in France for featuring this story on our "Plan B" against Yahoo!. It will be appearing in the May/June issue of Internautes on Page 12. For those of you who can't wait to pick up your copy, click on this link and go to page 12. En Mai, un invite surpirse pourrait etre present au conseil d'administration do Yahoo! Eric Jackson, un petit porteur possedant seulement 45 actions s'est mis en tete de bousculer la direction executive du groupe en commencant par virer son PDG. Son arme? Internet. Congrats to Carl Icahn and ISS on this news from the Wall Street Journal. A new perspective on Motorola's board can only be a good thing for shareholders. Proxy advisory firm Institutional Shareholder Services said Wednesday it is backing billionaire investor Carl Ichan's bid to join Motorola Inc.'s board. The recommendation comes as a blow to Motorola and Chief Executive Ed Zander, who has expressed his belief that Mr. Icahn's inexperience in the industry and history as a board member wouldn't add value to the handset maker. Over the past few weeks, the rhetoric between the two sides has gotten louder. Given the recent struggles in the world's No. 2 handset maker, ISS believes it is time for change. "Although long-term historical picture is more favorable, the significant near-term deterioration argues for a new perspective on the board," according to the report. Mr. Zander has argued that Mr. Icahn is not a technology expert, and that the companies on which he has taken an active interest have had inferior records when compared with Motorola. ISS noted that other incumbent board members have no technology experience. ISS cites Mr. Icahn's "positive track record for creating shareholder value across a diverse universe of industries, whether as a board member, or as an outside shareholder activist," as a reason why he should join Motorola's board. Mr. Icahn continues his push. "I am gratified that ISS has seen the need for significant stockholder representation on the Motorola board," he said in a statement. Motorola, meanwhile, said it disagreed with ISS. "Carl Icahn's success as an investor does not qualify him to serve on Motorola's board of directors -- investor experience is not director effectiveness," said spokesman Paul Alfieri. Motorola has been plagued with dramatic declines in the price of its handsets and the lack of next-generation phones, causing the company to issue profit warnings in the last two quarters. The weakness provided an opening for Mr. Icahn, who Motorola said began aggressively acquiring shares at the beginning of the year, to exert his influence. Mr. Icahn had initially called for an aggressive stock buyback that would've taken Motorola into debt, but has since reversed his position and called for improvements to the business. Motorola, meanwhile, moderately boosted its own stock buyback program although maintains roughly $9 billion in cash. The company swung to a loss in the first quarter and said sales for the second quarter would continue to slump. Mr. Zander, who is under increasing pressure after shuffling his management team, has his hopes pinned on a recovery in the second half. Got Ads? Why Can't Yahoo Compete? Yahoo reported yet another depressingly weak quarter. The Q1 2007 earnings conference call is a litany of lame excuses as to why Yahoo can't perform. One thing Yahoo is good at is plying an excuse. This time it's "Wall St. got ahead of itself on Panama." Of course, no mention of their trick last quarter, bogusly hyping Panama by saying they were launching it "earlier than expected". The story with Google is getting simpler - each quarter they mint $1B in profits by sticking to traffic and search growth, while having a global, diversified ad system that prints the money. Meanwhile Yahoo's market share has not grown in the past 3 years. Yahoo!’s market share has been flat and steadily eroding over the past 4 years, while Google’s has dramatically accelerated. Yahoo! had a 28.9% share in February 2003 (according to Neilsen NetRatings ), compared to 29.5% for Google. However, Yahoo!’s share had dropped to 19.5% as of December 2006, and Google’s had increased to 65.4% (according to Bank of America Equity Research). Google has grown its shareholder value 21 times more efficiently than Yahoo! over this time period, when the Internet ad market has been booming. It's a theme repeated over and over. While Yahoo claims to be "leveraging it's audience insight" in order to "be in position" to capture "the growth of the internet", Google has ACTUALLY done it. Yahoo has dithered. Unfortunately, the fact is that Yahoo has performed worse and worse since then. Google has eaten their lunch. Even Ebay is coming back stronger than Yahoo. Failure to focus on search share - instead Yahoo wanted "deep user engagement" and invested heavily (i.e. $500M+) in Hollywood type media with the Yahoo Media Group. Failure to focus on search monetization. Management let the Panama delays stretch to 2 years, losing billions in revenue and never setting the ship right at Overture. Failure to grow audience. Market share in Yahoo's non-search properties has been flat for the past 3 years. What has Yahoo done well? For a while, their display ad business was covering for the lagging search ads. No more. In Q3 2006, Semel warned of weakness in Finance and Auto sector display ads. Unfortunately, no matter how good display ads do, they are sensitive to seasonal and cyclic economic factors - more than search is. They can't make up for the loss of share and revenue on the search side. That's partly why the last few quarters haven't looked very good for Yahoo. Yahoo's Problem is Leadership. Semel. Yahoo's strategy has changed basically every 6 months under Terry Semel, as his initiatives have failed and Google has forced him to go someplace he doesn't want to be: Technology and Search. Q1 2007:"We have been executing aggressively against our plans to improve our search monetization, strengthen our display advertising business, and seize the opportunities we see in emerging areas like social media, mobile and video." Q1 2006:"The strategy that we have talked about for the last couple of years, to lead the shift from mass media to my media is starting to coalesce and the next phase of Yahoo! is becoming much more visible. You can see it through the continued development of communities on our network, the expanded programming of head and tail content and the evolution beyond web search to social search. All while providing personalized services for our users whenever and wherever they are." In 2007 it's all about search. Only one year ago, search is barely mentioned. Media, Community & Personalization was far more important to Yahoo at the time. Terry talked about moving "beyond web search". HA! Somehow I hope he didn't mean that Yahoo would be losing market share in web search... but that's what happened. Basically, Yahoo has been pulled into a war they didn't want, with a much more focused and powerful enemy. Semel doesn't have the ability to fight that war. Panama is not enough. It is worse than Google's current system in EVERY WAY. It's harder to use, it has worse ROI, the inventory isn't there, and it isn't a global diversified ad system - one that has search, content, and many other forms of advertising built-in. Google has all of that. For example, we have a number of clients with strong national brands. Actual CPCs on Google for these brand terms are $0.01 to $0.06. On Yahoo, the CPCs on the same terms are at least $0.10. So, even though Yahoo sometimes has a higher conversion percentage on those terms, ROI on Google can be two to three times or more what it is on Yahoo (using return on ad spend—ROAS—as the measure of ROI). And, because retailers with strong national brands drive a large percentage of their paid search sales through brand terms, brand term ROAS is a significant contributor to overall ROAS. As a result, overall ROAS on Yahoo is lower. Yahoo's inventory is weak - due to declining search share - 30% to Google's 60%. It's technically 3 years behind AdWords in functionality. So Panama, for the rest of the year can be expected to be blamed for disappointing results like it was this quarter. It's not the answer. Moreover, Yahoo announced a re-org late last year. They still haven't been able to hire an executive in charge of "audience", and this quarter's results pretty much bear out what the consensus was on the re-org: "Deck chair shuffling". The only internet related company performing worse than Yahoo at this time is Microsoft. If Panama hasn't lived up to hype, Microsoft's search and AdCenter products have been total, complete miserable failures. Full of spam, and losing traffic daily, despite huge platform advantages (IE7) that should have propelled them higher. So it's now possible that these two failing companies will get together, with Microsoft wanting to buy Yahoo to compete with the new boss: Google. That would be a complete disaster. The only good thing would be getting rid of Terry Semel. However, Microsoft is more lost than Yahoo, and folding Yahoo's 12,000 strong workforce into MSFT's 73,000 people would pretty much kill any chance Yahoo has of growing into competing with Google. Is There Any Hope for Yahoo? If Yahoo had a technical leadership injection, it could get back into the game. Things are broken, and Semel clearly can't fix them, but Yahoo does have some strength. Terry Semel, Robert Kotick, Roy Bostock, Ron Burkle, Eric Hippeau, Arthur Kern, and Gary Wilson should be Immediately Replaced on Yahoo!’s Board of Directors. However, I think the key to Yahoo's recovery is to figure out how to get advertisers to split their budgets closely between Google and Yahoo. Yahoo mainly needs more inventory. They need to copy Google's strategy of being the ad system for ALL media by 2010. They need to be able to say to big advertisers: "We can give you better deals, better service, better reach than Google." It's possible to say that because Google is on it's way to becoming incredibly dominant, and it has no shortage of arrogance in dealing with customers. Eventually it will screw up, and piss off big advertisers. Yahoo already has relationships and it could prosper as a strong #2. However, the likely scenario is probably Microsoft buying Yahoo. In that case, you should load up on YHOO stock now, in hopes that you get 30%+ premium over the next year on the buyout. And you should buy GOOG like crazy too. Because if Microsoft does win Yahoo, the combined incompetence will ensure that Google ends the biggest winner of all. Jim Cramer's Three Ways to Win with Yahoo! This came from yesterday's TheStreet.com article by Jim Cramer with his take on Yahoo! after this past week. Reluctantly, with full recognition of their own incompetence, it is time to buy Yahoo! (YHOO - Cramer's Take - Stockpickr - Rating) again -- if only for a trade back to $30. First, there are two people at the company who are not incompetent bozos: Jerry Yang and David Filo. These are the founders. I believe they must have a degree of pride. I know that they have been told that the problems at the company were related to a couple of underlings who were messing up. They were all fired. It turns out that the problems had little to do with these underlings at all. The problems were in the stars: Terry Semel and Susan Decker. Yang and Filo can fire them and see the stock back up at $30, when it can be sold. Second, the aggressive, emotional selling of this week is simply too panicky. The stock doesn't belong at $32. It also doesn't belong at $27, given the potential, Google (GOOG - Cramer's Take - Stockpickr - Rating)-wise, to ever get it right and the scarcity of Net properties. Finally, while the company is very expensive, once again the expectations have been washed out of the stock, just as when it was at $23. Worth it to start buying this hated monster on the "three ways to win" theory. This week has been one of the darkest for Yahoo! since our "Plan B" group started pushing for change at the Internet company on January 7th. From the first day after our campaign launched, Yahoo! 's stock price has been positive and ahead of Google's -- sometimes far ahead. There was a time, a few short weeks ago, when Yahoo! 's stock price was up 13% while Google's was down 13% since the shareholder advocacy launched. Tonight, in the after-market trading, Google surpassed Yahoo! for the first time since the early part of this year in terms of percentage gains. In fact, today is also the first day since our launch when Yahoo! 's stock price is below where it was on January 7th. As a shareholder group which believes in the long-term growth potential of Yahoo!, this has been an incredibly difficult week. Our group lost $7 million in shareholder value - from $61 million last week to $53 million tonight. Of course, we're in the same boat as all Yahoo! shareholders. There's no question that the market got way too jazzed up about the "quick-fix" impact of Panama on Yahoo! 's results. There was also a bit of "Google-had-its-time-in-the-sun-for-the-last-2-years-so-it-must-be-Yahoo! 's-turn" stock-picker mentality driving the jump in Yahoo! 's stock price. Several months ago, we cautioned that Panama was no cure-all for Yahoo! The biggest issue facing them is a continued loss of share in search. It's still an issue. Because of this, revenue growth has been steadily declining in each of the last 4 quarters. As Anthony Noto noted, it will be difficult to suddenly escalate the single digit growth to 20+% by end of year. This has been a difficult week for Yahoo! 's shareholders: a difficult Q1 that stands out even more when compared to eBay's and Google's stellar results announced in the days afterwards. Our group has offered a plan to improve Yahoo! We are asking other Yahoo! shareholders to join our group and support us. We believe in this company -- today, more than ever. Some Yahoo! shareholders have sold their stock as a sign of their displeasure (this selling continued, concerningly, today). That's their right. However, our shareholder group wants to be part of the solution. We believe there is still tremendous unlocked potential in this great company which possesses some of the best people in the technology world. We support Yahoo!, but shareholders need "Plan B" today more than ever. Yahoo Inc.'s first-quarter profit fell 11 percent, disappointing investors who have been betting that the Internet icon had regained its stride after stumbling through much of last year. The letdown zapped Yahoo (nasdaq: YHOO - news - people )'s stock, which plummeted more than 8 percent after the results were released Tuesday. Management added to the angst by leaving its financial outlook for the remainder of the year unchanged from its last forecast three months ago. The Sunnyvale-based company earned $142.4 million, or 10 cents per share, during the three months ended in March. That compared with net income of $159.9 million, or 11 cents per share, at the same last year. After subtracting advertising commissions, Yahoo's revenue totaled $1.18 billion. That figure fell about $25 million shy of the average analyst projection, according to Thomson Financial. Yahoo shares shed $2.61, or 8.1 percent, in extended trading after gaining 48 cents to close at $32.09 on the Nasdaq Stock Market (nasdaq: NDAQ - news - people ). The first-quarter downturn may renew concerns about Yahoo's ability to compete against Google Inc. (nasdaq: GOOG - news - people ), whose Internet-leading search engine propels the Web's most lucrative advertising network. Yahoo has pledged to narrow the gap with its rival this year with the recent introduction of a new marketing platform - dubbed "Panama" - that is supposed to do a better job of distributing ads that will spur revenue-generating clicks. Meanwhile, Google is bolstering its arsenal with its planned $3.1 acquisition of a major online advertising placement service, DoubleClick Inc.
Investors nevertheless had been hoping for more signs of a comeback in the first quarter, a sentiment that had helped lift Yahoo's stock price by 26 percent since the end of December. The rally recouped some of the losses registered last year when Yahoo shares dropped by 35 percent as the company struggled to keep up with Google. The lackluster performance culminated in a management shake-up that included the departure of Yahoo's chief operating officer, Dan Rosensweig. Some analysts believe Yahoo Chairman Terry Semel could lose his job as chief executive officer if Panama doesn't accelerate the company's earnings growth. Semel, who is approaching his sixth anniversary as Yahoo's CEO, didn't sound worried during an interview Tuesday. Besides Panama's long-awaited debut, Yahoo has also raised Wall Street hopes by negotiating potentially lucrative advertising partnerships with Viacom Inc. (nyse: VIA - news - people ) and the publishers of 264 U.S. newspapers. Google's heavy promotion of its own "Checkout" payment service, Yahoo will begin featuring small shopping cart icons alongside the ads of about 2,500 merchants who accept PayPal. The financial terms of Yahoo's PayPal partnership weren't disclosed. For those of us living below the 49th parallel, you might have not heard that the 2nd largest pension plan in Canada is looking to buy/takeover Canada's largest and oldest telecommunications company. Ontario Teachers' Pension Plan is seeking to win over support for their plan to push for change at BCE -- or Bell Canada as it's referred to by most consumers in Canada. To put this in perspective, imagine if CalPERS sought to step up its activist positions and philosophy and actually made a run at Verizon or AT&T. It's one thing to put out a Focus List of companies who are poorly governed. It's quite another to actually jump in the ring and actually try to more forcefully effect change. However, I enjoyed the Globe and Mail's coverage this morning of the latest developments, in which they quoted one BCE director as saying: "What Teachers is doing is disgusting.... These guys hold themselves out as paragons of governance, then they become activists who take their case to the press." To be sure, Teachers' is shining a light -- not just in Canada, but around the world -- as a leading pension fund (easily in the same league as CalPERS, CalSTRS, and Hermes) supporting and promoting good governance. Much of this credit lies at the feet of its leader, Claude Lamoureux (and several very capable lieutenants), who has been speaking out on this topic long before it was trendy. M. Lamoureux actually helped co-found the Canadian Coalition for Good Governance several years ago, which has done great work for this cause. Canada is not used to such tactics being employed in the battle for greater shareholder value creation. Its corporate boards and corporate governance practices tend to be more insular compared to the United States and Europe. Fight on, M. Lamoureux! We'll be watching. Yahoo Inc. named a major overhaul of its online-advertising systems after the Panama Canal. Investors hope for some insight Tuesday into whether the upgrade is leading the Internet company to smoother waters. Chief among their preoccupations is whether the online-ad-system improvements, made partly in hopes of bridging the gap with rival Google Inc., are leading advertisers to spend more money with Yahoo. Yahoo, Sunnyvale, Calif., said in January that it didn't anticipate any revenue impact from the improvements until the second quarter, a comment that some expect the company to reiterate when it reports first-quarter results. The Internet company has been wrestling with declining revenue growth and doubts by some investors about Yahoo's strategy and execution. But early indications are that advertisers like Panama, despite some frustration, particularly among small businesses, with the hassle of shifting over to a new system. Yahoo in early February altered the way its Web search ads are sold, changing from a straight auction system to one like Google's that weighs other factors besides advertiser bids in choosing which ads to display and what to charge. Among other things, such a modified auction system displays more prominently ads that users click on often, an arrangement that can increase Yahoo's revenue because advertisers pay only when a user clicks. Analysts say that for some big, brand-name advertisers, the Panama search-ad upgrade is improving the financial return on what they spend with Yahoo. The search ads are "more effective, getting more people clicking on them, and therefore I'm spending more money," says Paula Drum, vice president of marketing at H&R Block Inc., the Kansas City financial and tax services company. Based on similar feedback, Goldman Sachs analysts recently raised their Yahoo revenue estimates to reflect a benefit from Panama beginning in the first quarter of 2007. Research firm eMarketer Inc. estimates that Yahoo's search advertising will rise about 28% this year to $1.35 billion, when certain payments to partners are factored out. That would be a big improvement from a 7.5% increase last year. "It's doing a turnaround," says eMarketer senior analyst David Hallerman. Some analysts caution that the Panama tweaking of Yahoo's search-ad auction will go only so far to boost revenue, particularly if Yahoo doesn't greatly expand the volume of search queries that it handles and can use to place ads. Yahoo's share of the U.S. search market was 28% in the first quarter, essentially flat from the fourth quarter of 2006, according to Majestic Research Corp. and comScore Networks Inc. That compares with Google's 48% share in the first quarter. There are signs that Yahoo is making progress in this area. The company is finalizing a major deal that would have newspaper partners use its search on their Web sites, according to people familiar with the matter. That deal could be announced as early as this week. In the past week, Yahoo announced an exclusive, multiyear agreement to provide search-and-advertising services to some sites owned by media giant Viacom Inc. A Yahoo spokeswoman declined to comment for this article, citing a pre-earnings quiet period. A number of years ago, one of Jackson Leadership's longtime clients asked us to assess one of their "high-potential" leaders who was up for a key new leadership position within the organization. His name was Bob. Bob was told he had to go to visit with Jackson Leadership for a day to be "assessed." Later, he told me that he didn't know what to expect when he first heard this. He knew that we'd worked with his company for several years on assessing and developing their leaders, but didn't know quite what that meant. He knew he wanted the job, though, so gladly agreed to visit with us. We put him through an "assessment center." We sent him some surveys and tests in advance, which measured his personality but also included a 360 survey, where peers, direct reports and bosses gave him feedback on his managment style. We then spent a day with him, where we interviewed him about his background, asked about his careers objectives, and posed a number of "behavior-based questions" which asked him to recount specific examples of work situations when he had to overcome some challenges. We even gave him some "case studies" to work through, which he had never seen before, and made him give a couple of presentations to us about the courses of action he was recommending. All in all, the "assessment" gave us -- as third-party observers of leadership potential in organizations -- a sense of what kind of leader Bob was today and what his future potential was; his strengths and weaknessses. Over the next few days, we scored the results of the different exercises and sent a comprehensive report to the selection committee for the job. He had great technical skills. There was no question in our mind that Bob could do the job. We did recommend him ... with one reservation. Bob thought he was a hilarious. He was always cracking jokes around the office and he thought his co-workers really appreciated his levity. The problem was: he was dead-wrong. Several of his colleagues (especially women) had anonymously commented in their 360 surveys that they found his humor off-putting and -- sometimes -- demeaning. We advised Bob that he needed to be aware of this and "dial down" his humor. We didn't want him to completely lose his funny-bone; however, he needed to be more aware of how it was coming across to those around him. We suggested the selection committee give him the job -- conditionally for 6 months -- with a strong suggestion of self-monitoring for this nasty habit. I went to see Bob, after we'd sent him the report (as well as the selection committee). It was an overall positive report -- I thought -- so I was expecting a relatively easy and straightforward one-on-one meeting to discuss the content. "What did you think, Bob?," I asked innocently. He paused and said, "you know, when I finished reading this report last night in my kitchen, I wanted to come over to your office and wring your neck." He continued, "I actually threw your report across the room, just as my wife was passing by. She asked me what had got into me. I told her that 'this Jackson guy doesn't know what he's talking about' and flung the report to her, pointing to the section about my sense of humor. 'This?,' she said. 'I've been telling you to fix this for years!' I couldn't believe it, so I called my best friend. He basically said the same thing, so I figured that I'd better come in and meet with you today." Well, Bob took the job, of course. And he did great. At the 6 month mark, no one from the selection committee even spoke to another about whether to keep Bob on. It was obvious to everyone that he'd corrected that one aspect of his style and he was doing a great job. A few months back, I was roaming the halls at the client organization after another meeting and someone flagged me down to talk. "Hey, what did you do with Bob?," they asked. "He's a totally different person today from a year ago. He's so mature." The truth is that I didn't do much, Bob did. Sometimes changing a small aspect of your leadership style can have a huge impact on how others perceive you. The next time someone asks you if people can change from a leadership development program, ask them, "What about Bob?" By SHIRA OVIDE April 5, 2007 1:16 p.m.
NEW YORK -- Influential advisory firm Institutional Shareholder Services recommended that New York Times Co. shareholders withhold their votes for the company's public directors, adding ammunition to critics of the publisher's corporate governance. The proxy adviser, known as ISS, said New York Times' stockholding structure makes the company less accountable to public shareholders. "Shareholders are left with few avenues through which to voice their opinion other than by withholding [votes]," ISS said in a report released Thursday. "A strong message to effect change is necessary." Some shareholders, led by Morgan Stanley portfolio manager Hassan Elmasry, have pushed New York Times to eliminate its dual-class shareholding structure, which gives control of the company to publisher Arthur Sulzberger Jr. and his family. Critics contend the structure insulates the company from criticism and accountability from investors of Class A, or publicly held, shares. The fight is quixotic, however, because the stock structure can be changed only by the controlling shareholders, and they have been unwilling to do so. "We are disappointed that ISS has recommended a withhold vote for our Class A directors," New York Times spokeswoman Catherine Mathis said in an emailed statement. "We note, however, that they did not advocate their removal, which we see as recognition of the high quality of our board members." Public shareholders will vote on the re-election of four Class A directors at the company's annual meeting April 24. ISS recommended withholding votes for all four nominees. ISS said it doesn't recommend the board members be removed, but said New York Times should do more to ensure accountability to public shareholders. The firm said New York Times should separate the roles of chairman and publisher -- positions both held by Mr. Sulzberger -- and establish key board committees with directors elected solely by Class A shareholders. Warren Buffett's recent letter to shareholders contained the requisite number of pearls of wisdom. One particularly caught our eye: what makes a great director? Corporate Governance has become a hot topic in the wake of scandals at Enron, WorldCom, and others in recent years. The consultants and SEC have moved in, as a result, with a predominantly "tick the box" view to concocting the "right" mix of directors on a given board. Sufficient "independence" is seen as a must by most experts. Simple but powerful - classic Buffett. I like the way that he describes the fourth characteristic as "truly" independent. Independence has become the most cliched term in this new era of governance and, because it suffers from so many different definitions, the most useless. What makes a great director is how he or she conducts him/herself in the boardroom. Do they ask tough questions - even of the CEO who appointed him/her to the board (the one, as Ralph Whitworth says, who brought them to the dance)? Do they push for answers when they are dissatisfied with the initial response to their questions. Do they admit their ignorance in a certain area but still ask for clarification, not worried about looking bad in front of their peers? These are all process issues. The debate in corporate governance matters has zeroed in on structural definitions. That's a shame. What I like about Buffett's list is that -- even though a list, by definition, has to focus on structural characteristics -- they lend themselves well to how a director will conduct him/herself in the boardroom behind closed doors. 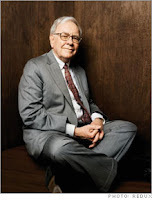 If you were a fly on the wall of a boardroom consisting only of directors meeting Buffett's four qualities, chances are good that there would be a real spirit of debate and constructive criticism, as well as collegiality -- the nirvana of corporate governance proponents. In a 2-year McKinsey and Korn/Ferry study of governance I was a part of at Columbia Business School, we found, after running regressions on hundreds of governance-related characteristics as predictors of long-term increases in shareholder returns, that only one stood the test of this type of analysis: percentage of outside directors who own meaningful stock in the companies on whose boards they sat -- where they had purchased the stakes instead of receiving options/grants. This certainly creates an "owner orientation." The paper covering this study is here. As we move into proxy season, all boards and heads of Governance Committees would do well to review Buffett's list and measure their own set of directors against it. The press have been calling it “Yahoo’s Plan B.” Proposed by Eric Jackson, who posted a video to YouTube about it, the nine-point plan has been gaining some grassroots support. But does a turnaround plan promoted in such an unorthodox manner by a minority stockholder really have any hope of success? Eric Jackson reportedly owns only 45 shares of Yahoo stock, but he’s making a huge splash with them. It’s a tribute to his ability to use community-building tools – the same kinds of tools that Yahoo has been trying to leverage with its web 2.0 acquisitions – that his campaign has been gaining steam. He says he has a group of like-minded Yahoo shareholders backing him up that together own close to a million shares of the beleaguered company. He started in early January with an appeal to other shareholders to present ideas for a “Plan B” to save the company. His outreach tools include a blog, YouTube videos and a wiki. He seems to have received a lot of input. In late February he submitted a finalized version of “Plan B” to Yahoo’s corporate secretary with the intention of presenting the plan at the company’s annual meeting in May. Jackson isn’t simply web savvy, if his biography can be believed. He has a PhD from Columbia University Graduate School of Business in New York, where he specialized in strategic management and organizational behavior. His thesis would seem to be right up the alley of trying to turn Yahoo around; it covered “how the composition and processes of top management teams and boards are linked to longer-term firm performance,” to quote the bio directly. He has several publications on corporate management performance to his credit, and has served as vice president of strategy and business development at VoiceGenie, which is now part of Alcatel. He is currently the CEO of his own consulting firm, Jackson Leadership Systems. So are the nine points of Plan B going to save Yahoo, or is something a little more self-serving at work here? Let me paraphrase Star Trek's Dr. McCoy and say I’m a writer, not a business analyst. On the other hand, I’ve spent about seven years covering technology and technology-related companies. I’ve looked at my share of financial results, and for the last two years I’ve followed the search field pretty closely. So what you’re about to read is coming from a somewhat informed layman. Keeping that in mind, let’s see what Jackson’s plan offers Yahoo. The first point is the immediate replacement of Terry Semel as Yahoo’s chairman and CEO. Jackson lists a number of missteps Semel made during his tenure, including the failure to purchase Google in 2002, MySpace in 2005, and YouTube in 2006. He also argues persuasively that Yahoo’s loss of shareholder value is a cause for dismissal. While acknowledging that Semel’s defenders will point to a rise of 227 percent since Semel started at Yahoo in 2001, Jackson points out that most of that gain, which occurred over a one-year period, “had to do with a general recovery in the Internet Advertising market, which benefited Yahoo and its two main rivals – Google and Microsoft – during this time.” Jackson also points to Yahoo’s eroding market share in search as evidence that Semel’s tenure has been toxic to Yahoo. With Terry Semel already 64 years old, it might make more sense to seek his immediate retirement rather than his head. The second point concerns Yahoo’s board of directors. Jackson and his fellow shareholding sympathizers want to see six out of the ten directors replaced: Terry Semel, Robert Kotick, Roy Bostock, Ron Burkle, Eric Hippeau, Arthur Kern, and Gary Wilson. The only members they want to see stay include Jerry Yang (co-founder of Yahoo), Ed Kozel, and Vyomesh Joshi. From the explanation given, Jackson holds those six board members as most responsible for Yahoo’s recent missteps (because Semel reports to the board) and believes they must be held accountable. As for the ones favored by Jackson, Kozel and Joshi have directly purchased Yahoo shares, but the other board members “have only exercised stock options of late.” It’s worth pointing out at this juncture that Eric Jackson has nominated himself to the board, so he might have more than just the other shareholders’ interests at heart. The third point involves the Yahoo Media Group and campus in the Los Angeles area. Jackson wants to see it closed because “There are no meaningful outputs from the group to speak of which have had any positive shareholder value-creating impact.” The Yahoo Media Group was created a little over a year ago and run by former ABC TV executive Lloyd Braun. The goal, apparently, was to enhance Yahoo’s content and therefore attract more visitors. It was part of a larger strategy to be a bigger player in the entertainment field, which seems a natural move given Semel’s 24 years at Warner Brothers. It’s a move, Jackson insists, that hasn’t worked for Yahoo. Eric Jackson seems to think Yahoo has lost its way, which is why the fourth point of Plan B calls for the company to make additional research and development investments in the Technology Group. Certainly, it can be argued that Yahoo’s competitors (particularly Google) have moved much more quickly to implement more interesting technologies. Indeed, some of Yahoo’s problems can be attributed to this slowness; for example, more than one observer has pointed out the irony that Google’s AdWords and AdSense were “inspired” by Yahoo’s search engine advertising (an expertise Yahoo gained from purchasing Overture) to the point of Yahoo filing a lawsuit…and that Yahoo’s Panama is now very much like Google’s search advertising. The increased investment in research and development is supposed to come in part from closing the Yahoo Media Group and campus. The fifth point of Plan B is a call for efficiency. Yahoo has never properly streamlined many of its purchases, nor rolled them together as would be expected. Jackson gives several examples: Flickr is still distinct from the homegrown Yahoo MyPhotos, and del.icio.us is still separate from MyWeb. Jackson believes that it makes sense to roll these similar groups together, and that it should have been done a long time ago. This would increase the company’s profitability by saving some money. Jackson would also like to see some clarification as to who has “distinct ownership and accountability” for these key services. The now-famous Peanut Butter Manifesto made it clear that this kind of restructuring is sorely needed at the search company. The seventh point is concerned more directly with the company’s stock price. Jackson wants to see Yahoo step up the pace of the $3 billion stock repurchase plan that the company announced in October 2006. Interestingly, the company’s stock price bottomed out on the same day that Yahoo unveiled its plan to repurchase that much stock over the next five years. According to Jackson, the stock’s price has been rising steadily since he went public with his work on Plan B on January 7, 2007. If the stock price continues to increase, it will decrease the number of shares that Yahoo would need to repurchase. So Jackson and his cohorts “strongly wish to see evidence that the board of directors is accelerating the share repurchase now, rather than when the stock increases in value substantially further months down the road.” One wonders if it isn’t just a little presumptuous to think that Yahoo’s rise in stock price is due to Plan B. In the eighth point of Plan B, Jackson calls for Yahoo to pay a modest annual cash dividend on its stock. He thinks that five cents a share is about right; it comes to about $40 million a year, which should not inhibit the company’s ability to compete effectively. Why? “More important than the cash to shareholders (which does increase value in and of itself), the dividend would be an additional discipline to Yahoo! management to spend its cash wisely. It would also symbolize management’s confidence in the business, moving forward, that it will plan for and can sustain this dividend to shareholders.” In short, it’s another note in the theme of accountability and taking responsibility that runs through the plan. While much of the buzz surrounding this grassroots campaign has been positive, Jackson has certainly received his share of heat. Some of the comments on his blog, especially in reply to the finalized version of Plan B, have accused him of being self-serving, to put it mildly. On the other hand, at least one observer thinks the plan doesn’t go far enough. With Yahoo being a weakening second to Google, the latter’s dominance of the field will only continue to increase, squeezing out the rest of the competition. This is bad for those of us who want to see continued search innovation. Jackson may not have all the answers; his grassroots campaign may not even succeed. But he has brought a focus to Yahoo’s woes, and how deeply they need to be repaired, that not even the company’s own restructuring plan (released early in December) has been able to bring to bear. One way or another, Yahoo will be forced to find its way; let’s hope it leads to a stronger future for the search engine. STANFORD, Calif., Feb. 28 – Eric Jackson only owns 45 shares of Yahoo stock. But armed with a PhD from Columbia University in Strategic Management,earlier this year he devised a strategy for shareholder activism traditionally limited to hedge funds and major investors. A 34 year-old "leadership consultant" from Naples, Fla., Jackson has set out ot rally disappointed shareholders against Yahoo management and corporate strategy. He's successfully built a community of online supporters over the past few months via a blog, YouTube videos and a wiki, a user-generate content site. His success, suggests that a new form of shareholder democracy could be emerging on the Internet. Earlier this year, Jackson delivered “Plan B,” a nine-step proposal to improve Yahoo performance, to company management. The plan’s top three points called for the ousting of Chief Executive Officer Terry Semel and a slew of Directors, and the closing of Yahoo’s Los Angeles Media Group and campus. Jackson also nominated himself as a candidate for Yahoo’s Board of Directors. “Plan B” premiered on Jackson’s blog Breakout Performance on January 7. Jackson then posted a video of himself introducing the plan on YouTube. On both forums he invited investors to share their ideas and to help finalize “Plan B” using a wiki. During the ensuing weeks he covered investor and media response on his blog and posted more videos to YouTube. In March, he partnered with YouChoose.net, a new company that runs online pledge campaigns. The site tracks shares or signatures committed, posts relevant news articles, and hosts discussion forums. Jackson did not completely forget old technologies: He also picked up the phone and called the company’s top institutional shareholders. They include mutual fund powerhouses like Legg Mason, Vanguard and Janus. “The response has been positive,” Jackson said. “People are saying: 'Thank you for doing this. I have 100 shares, count me in,'” he said. About 75 investors holding 1.91 million shares signed on to “Plan B,” according to Jackson. The commitments represent a small sliver of the 1.36 billion shares outstanding. To date, the group does not include any of the company’s top ten intuitional investors and falls short of Jackson’s 10 percent of market cap, or 136 million share target. Jackson first grew interested in shareholder activism, and the people who are willing to “stick their necks out,” while studying at Columbia. There he met investors like Ralph Whitworth of the hedge fund Relational Investors who recently forced change at Home Depot. “I became familiar with the strategy of buying a small stake in a company that’s poorly run, advocating change, and moving the stock price up,” Jackson said. At the same time, Jackson began noticing how politicians like Ned Lamont (D-Ct.) used new community-building techniques on the Internet to gain support. Lamont beat Senatorial incumbent Joe Lieberman (D-Ct.) in the primary election before losing to Lieberman in the general election. “Lamont came out of no where,” Jackson said. “I began thinking that maybe all these things could come together so that the individual investor could use web elements to advocate change like large hedge funds do,” Jackson said. Last year he did not have a take-over candidate in mind so he started blogging about a variety of leadership issues. “I stumbled upon writing about Yahoo,” he said. When he did, he was surprised by the strong reaction. Former employees, current disgruntled Yahoos and investors alike responded to his posts. Jackson believed he had found his company. Not only did Yahoo have an active community of followers on the web, it was at a critical juncture. For the past year the Yahoo’s lackluster performance under-whelmed analysts, the company continued to lose market-share in the search world to competitor Google, and the whisper that Semel was not fit to command buzzed on Wall Street. The stock fell from its 52-week high on April 21 of $34.09 to a low of $22.65 on October 26. Since then the stock price steadily rose and closed at $30.33 yesterday. Jackson made his move and bought 45 shares of Yahoo stock in early January, when the price registered in the high twenties. “Right now Yahoo is a pretty big chunk of my personal portfolio,” he said. “I maximized my investment because I saw that the company was undervalued. Yahoo is at a critical point right now, and if it continues to drift then we could be in a tough spot in six to 12 months,” he said. Jackson devotes between 35 and 40 hours a week to this campaign. “Whether this succeeds or not, I hope I am laying the groundwork for others to follow the model. I hope I am creating a new form of shareholder democracy and I hope that shareholders will become more active and vigilant,” he said. “Whenever a communication innovation lowers the barrier for collective action, then a group can do things that they would not have believed possible,” said Howard Rheingold, author of Smart Mobs: The Next Social Revolution. “Plan B” is garnering some attention from Yahoo. Negative comments from current employees emerged on Jackson’s blog after he posted a letter from a former employee that outlined Yahoo’s perceived weaknesses. Helena Maus, Director of Corporate Communications at Yahoo, declined to comment on Jackson but said in a statement:“We are always interested in the views of our shareholders. We understand that Eric Jackson sent a proposal to Yahoo!, and we plan to review it." The company noted that under Semel’s guidance, Yahoo’s profits and stock price had grown over the past five years. Jackson’s success may be determined at the upcoming annual shareholders meeting in May. Shareholders are scheduled to elect next year’s Board of Directors. Time will tell whether a majority of shareholders will follow Jackson’s direction to fire the current Directors and elect him to the Board. He will need votes from many more shareholders than the 75 who have pledged their support thus far. Of course, the financial success of Jackson, Semel, and employees with company stock also rides on Yahoo’s share price. Since the beginning of the year the stock price climbed 18 percent. During this period Yahoo released fourth quarter and year-end financial results that narrowly beat analyst expectations, rolled-out a new advertising platform, and launched Brickhouse, an in-house incubator for new business ideas.